China | Hey, you know what? Cinese agressiveness and expansionism over other countries' teriitorial sorignty has been recognaized in the world. Japanese demonstrators stage a massive anti-China protest as tensions between the two countries mount over disputed islands. Please click the followin URL and also watch the next movie,too. You would understand which saide is right. The Senkaku Islands are Japanese territory, which were incorporated into Okinawa Prefecture in 1895 through Japan’s “prior occupation” of “terra nullius (no man’s land).”Japan was the first country that introduced International Law in East Asia and established a modern sovereign state there. 1.Title based on contiguity has no standing in International Law. 2.Title by discovery is only an inchoate title. 3.If another sovereign begins to exercise continuous and actual sovereignty, and the discoverer does not contest this claim, the claim by the sovereign that exercises authority is greater than a title based on mere discovery. Reasons 2: Chinese didn’t discover the Senkaku Island first. Chinese Investiture Missions sailed to Ryukyu through the Senkaku Islands only 23 times in507 years, while Ryukyan Tributary Missions sailed to China through the Senkaku Islands over 580 times in the same periods. Reasons 3: There is no historical fact that Chinese has ever exercised any “effective control” on the Senkaku Islands. Reasons 4: The Japanese map never admitted that the Senkaku Islands were Chinese territory. Reasons 5: Senkaku Islands were not stolen from China, so it has nothing to do with Cairo Declaration. 1.China is not even the first discoverer of the Senkaku Islands. 2.There is no historical fact that China has ever exercised any “effective control” on the Senkaku Islands. 3.China had recognized the Senkaku Islands as Japanese territory until 1971 for 76 years. The Senkaku Islands have never belong to China, but are legitimate territory of Japan which were incorporated into Japan strictly following procedures prescribed by International Law. China has been becoming more and more dangerous because of its aggression. Chinese military territorial expansionism has been escalating more and more and jeopardizing the stability of peace among Asian Nations as well as Taiwan and Japan. China is originality communist country. However, after accepting free market capitalism in its economy, its GDP grew at very high speed and its military modernization and variety of ammunitions developed very much. After the declaration of independence of China, it has already invaded Tibet, the East Turkistan and the part of Mongolian territories. And now, China is apparently seeking for the Ocean territories in the South Sea and the East China Sea to get its own natural resources in selfish manner. Here the movies explains the aggression of Communist China below. As many of you are aware of Chinese rapid military, economic and its territorial expansionism. Up until the early 1970’s, after the establishment of diplomatic relation between the United States of America and Communist China, the country was still way behind in many aspects such as economy, military, education, infrastructures of its main cities except the huge population that was mostly in poverty. However, around in the middle of 1980’s, the government started to accept free market economic system, capitalism though the country itself was communism. The U.S capitalists considered that they could make huge amount of profits by using Chinese cheep labor force in constructing assembly lines in China and export their products to the U.S. and other markets in the world. That was a beginning of the issue. After over 20 some years, Chinese Economic kept double digits growth. And now the GDP level is number two next to the U.S. though the gap between the rich and the poor is unbearably big. The rich became richer and the poor are still in poverty. Anyway, the country has gotten a huge amount of foreign government bonds and currencies reserves. Among them China is a number one country which possesses the U.S. Government Bonds. China has developed and modernized its military power size and the ammunitions. They have nuclear missiles that can reach the U.S. And they even have raptor type fighter planes, nuclear power submarines. And now they are trying to construct some aircraft carriers. While strengthen the military power, China has sneaky strategy to invade Japan. That is to purchase vast area of real-estate in big cities in Japan such as in Nagoya and Niigata. They are planning to unusual size of Chinese Embassy or Consulate. There’s a report saying. Chinese wants to have huge places that Japanese domestic law cannot apply and the places would become spy training facilities. The video about the Invasion by China was released by someone and somehow. The video must be longer than this but proof video was appeared on YouTube in the middle of night. There must be something to protest DPJ’s intension of concealment about the facts: the ramming of Chinese fishing boat to Japanese Coast Gourd Vessels in Japanese territory, SENKAKU. The government managed by mostly fake Japanese assembly members of DPJ was hiding the video and had not shown it to Japanese people. There is a possibility that they erase the video as soon as they find it. So please see it immediately. Japan Rallies Against China Over Disputed Island. invaded Tibet, Uyghur and the part of Mongolia. Communist China has also had territorial disputes over Parcel Islands and Spratly Islands in South China Sea among Vietnam, Malaysia, Indonesia and Philippines. And now, Communist China wants Japanese territory, called Senkaku which is composed of 7 small islands in East China Sea. It was the first time China started to insist that the Islands had belonged to it when scientific research done by the UN announced that there was a possibility of huge amount of natural resources such as natural gas, crude oil,precious metals and chemicals. There is no doubt that Senkaku Islands and surrounding Ocean within EEZ Line are Japanese territories. The world society should know the truth. Chinese Expansionism has three key strategies. First, controlling media, not only in domestic society but also foreign countries’ .They don’t hesitate to tell lies and fabricate false information--even a false history, and mislead the world society. Second, they make its own new laws---for example, a law which is beneficial territorial ocean law for its sake. They consider any nations that do not follow the laws would be antagonistic and that would be a reason to justify their invasions. Third, escalating the size of military power and its modernization--this includes a psychological strategy. The more Communist China’s military power becomes big, the less number of nations would be able to confront against China. I have introduced the following news articles, ABC news and BBC News. However, I recommend these writers to make further research and to offer more accurate facts. TOKYO (Reuters) - Thousands of protesters marched through Tokyo on Saturday to demonstrate against what they called China's invasion of disputed islands that both countries claim. This was the second major anti-China rally in Japan since ties between Asia's top economies worsened last month when Japan detained a Chinese trawler captain whose boat collided with Japanese patrol ships near the disputed islands -- called Senkaku in Japan and Diayu in China. More than 2,000 protesters gathered in Aoyama Park, which is built on what was once a military shooting range, on Saturday afternoon. 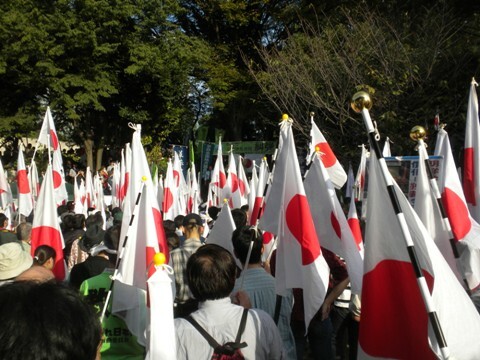 They marched through the busy Roppongi district to the Chinese Embassy, holding up Japanese flags and shouting slogans. "The Senkaku islands belong to me and every Japanese. I am angry as our belongings were stolen," said a 23 year-old student, Masato Yoshida. 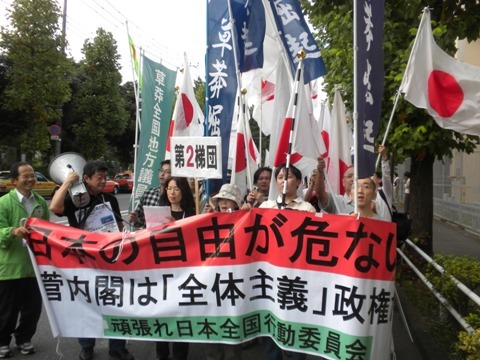 One of the organizers of the rally was Toshio Tamogami, a former air force chief who was sacked after publishing an essay that argued that Japan was not an aggressor in World War Two. He also organized an October 3 rally in which around 2,700 people took part, criticizing China and blasting Prime Minister Naoto Kan's handling of the territorial dispute. Critics charged that Kan caved in to pressure from Beijing to release the captain of the fishing trawler. Amid the diplomatic row between the two nations, four Japanese citizens employed by construction firm Fujita Corp were detained in China on suspicion of illegally entering a military zone, but they were subsequently released. Japan and China are trying to arrange a formal summit meeting between the two countries' leaders at the end of October on the sidelines of a regional summit in Vietnam. Kan and Chinese Premier Wen Jiabao both called for better ties at an informal meeting this month, but they also stressed their claims to the uninhabited islands, near potentially huge oil and gas reserves in the East China Sea. Ties between China and Japan have been strained by a territorial row over a group of islands, known as the Senkaku islands in Japan and the Diaoyu islands in China. The BBC looks at the background to the row. The eight uninhabited islands and rocks in question lie in the East China Sea. They have a total area of about 7 sq km and lie northeast of Taiwan, east of the Chinese mainland and southeast of Japan's southern-most prefecture, Okinawa. They matter because they are close to strategically important shipping lanes, offer rich fishing grounds and are thought to contain oil deposits. The islands are controlled by Japan. The latest row, in September 2010, was sparked by Japan's seizure of a Chinese trawler that collided with two coast guard vessels near to the islands. Japan says it surveyed the islands for 10 years and determined that they were uninhabited. That being the case, on 14 January 1895 it erected a sovereignty marker that formally incorporated the islands into Japanese territory. The Senkaku islands became part of the Nansei Shoto islands - also known as the Ryukyu islands and now as modern-day Okinawa prefecture. After World War II Japan renounced claims to a number of territories and islands including Taiwan in the 1951 Treaty of San Francisco. But under the treaty the Nansei Shoto islands came under US trusteeship and were then returned to Japan in 1971, under the Okinawa reversion deal. Japan says that China raised no objections to the San Francisco deal. And it says that it is only since the 1970s, when the issue of oil resources in the area emerged, that Chinese and Taiwanese authorities began pressing their claims. China says that the Diaoyu islands have been part of its territory since ancient times, serving as important fishing grounds administered by the province of Taiwan. The Ministry of Foreign Affairs says that this is "fully proven by history and is legally well-founded". Taiwan was ceded to Japan in the Treaty of Shimonoseki in 1895, after the Sino-Japanese war. When Taiwan was returned in the Treaty of San Francisco, China says the islands - as part of it - should also have been returned. But Beijing says Kuomintang leader Chiang Kai-shek did not raise the issue, even when the Diaoyu islands were named in the later Okinawa reversion deal, because he depended on the US for support. Separately, Taiwan also claims the islands. Have there been incidents before? China's Ministry of Foreign Affairs says that the issue should be shelved for future settlement and that the two sides should try to prevent it from becoming "a disturbing factor" in bilateral ties. There have nonetheless been sporadic incidents over the islands. In 1996 a Japanese group established a lighthouse on one of the islands. Chinese activists then sailed repeatedly to the islands and in one incident, Hong Kong activist David Chan jumped into the sea and drowned. Since then, there have been periodic attempts by Chinese and Taiwanese activists to sail to the islands. 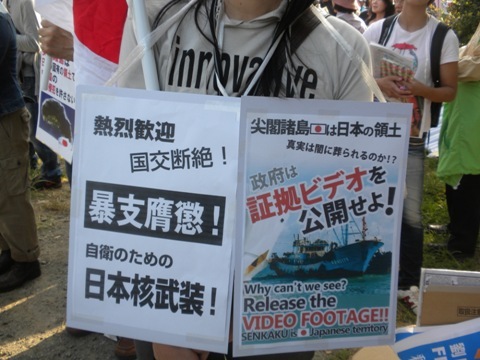 In 2004, Japan arrested seven Chinese activists who landed on the main island. There have also been face-offs between Japanese patrol boats and Chinese or Taiwanese fishing vessels. In 2005, 50 Taiwanese fishing boats staged a protest in the area, complaining of harassment by Japanese patrols. The Senkaku/Diaoyu issue complicates efforts by Japan and China to resolve a dispute over oil and gas fields in the East China Sea that both claim. It also highlights the more robust attitude China has been taking to its territorial claims in both the East China Sea and the South China Sea in recent months. In the latest row, Beijing cancelled talks on the oil and gas field issue. Small anti-Japanese protests were held in several cities in China. China also cancelled a visit by 1,000 Japanese students to the Shanghai Expo and a concert by a top Japanese band. In the end, Japan released the entire crew of the trawler - first the 14-member crew and then the captain, several days later.